Boa is an unusual thing, an anomaly of a species which is rare and foreign as-is, he's truly the first of his kind. Height-wise, he's smaller than average, only reaching the shoulder of the average person. 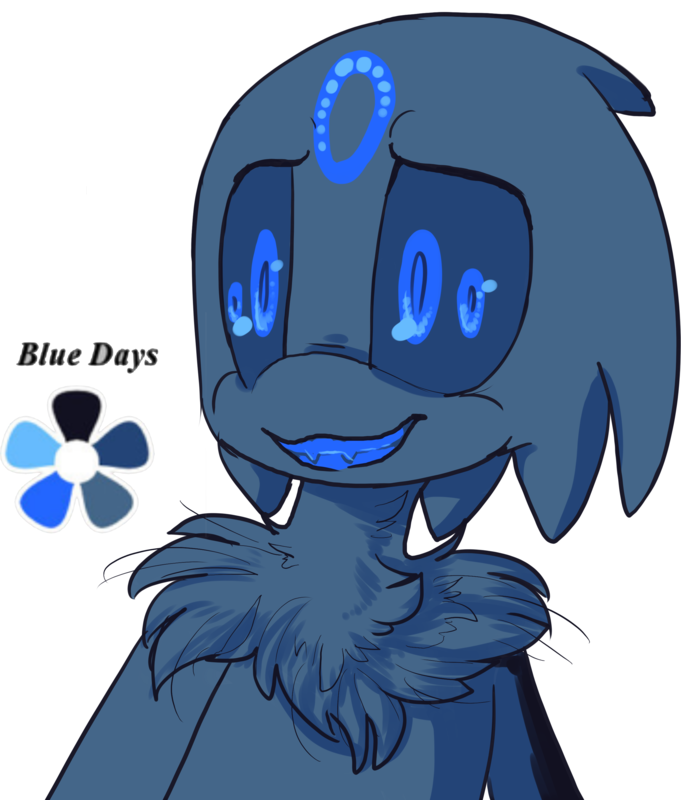 A dark blue creature, the only fur on him is on his chest - the rest of his body is smooth skin and has often been compared to have the texture of a frog. And is also squishy. On his wrists and ankles are blue markings, similar to the oval on his forehead, where the skin is thin enough to see the blood beneath. Another unusual trait for Boa is that he also has three digits on his hands and feet instead of five, and he has claws instead of fingers. And finally, Boa's eyes have black scelera with... two pupils each. the pupils themselves are bright blue, and flow with energy. A final note about his bare appearance is that his left arm is off-coloured - a deep blue, nearing black. This arm is fake, and he cannot use his powers with it. His previous arm was dissolved by blood, and the new arm is a psychic construct formed by his housemate, Virus. An open white jacket with black pants and white shoes. It's often paired with a white hat, though this is entirely optional. If he has the hat, you can often find him spinning it around his claw. Rather than wear a shirt, instead he adorns a large teal poncho-scarf that drapes past his shoulders and covers his chest. This is usually seen with the additional of small teal goggles on his head. He doesn't need them - he has perfect eyesight. Boa just thinks they look cool. In addition, he's entirely capable of changing his physical appearance, including the markings on his body, but he sees no need to, and doesn't like to. This does, by all accounts, make him a shapeshifter. He's honestly not sure why he can do this, yet other members of his species are entirely incapable of this ability, but he's never really explored who and what he is. Reading books and writing his own. Harmless experimentation, and making new discoveries. Keeping busy and working. He likes having something to do. Violence and aggression, be it at someone else or himself. Weapons, specifically swords. And blood. Being alone. It tends to make him think. He needs to be surrounded by friends. "I'm hardly interesting. But you? Tell me more!" Despite the freakish appearance which may put you off at first, Boa is a good person. A genuinely good person who does his best to help those in need, even if it involves a little bit of self-sacrifice. He doesn't see himself as a special snowflake or unique, and would rather people flourish and work hard to do better for themselves and others so society can redeem itself. He's a very logical person and this side often shows when people are in a bad place, and will reward a need for pity with brutal truth if it would mean it snaps someone out of something. Probably an important part to note is that Boa does not share his problems at all, even if doing so would benefit him in the long run. He will always, no matter the person or the situation, put on a smile and say he is fine (like a huge baby). He will not share his past. He will not share what he's been through, or what he's currently going through. And needless to say, when people pressure him into spilling his beans, he gets stressed and flustered and angry, resorting to shutting people out without thinking. Boa is no fighter, and he hates to be the cause for pain, almost having a phobia for it and outright refusing to lay a hand on anyone who's giving him trouble. 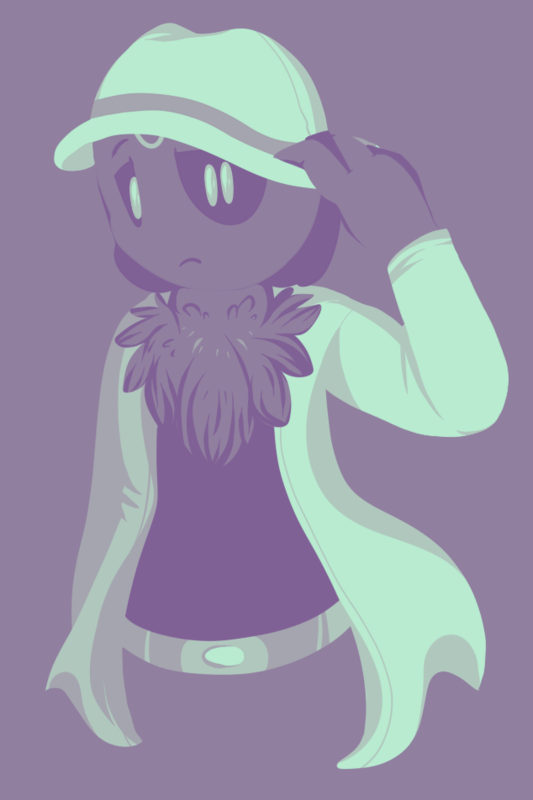 A complete pacifist, Boa is almost a pushover and would rather flee and hide than get involved in any sort of physical conflict. He doesn't train or have any knowledge of fighting, preferring to dig his metaphorical nose into the pages of books to learn of new things and give in to his researcher heart. A curious and inquisitive fellow, who just wants to learn what makes the world 'tick', as recently it's the only thing keeping him going. Boa manipulates something simply called 'anko', which is the term used for the blueish substance he's made of, both inside and out. It's often referred to as his 'blood' or 'life force', and is essentially both rolled into one. Although it's a colourless gas, when condensed and pressured, it takes on a blueish hue and can solidify in a crystal-like manner. He can manipulate it both inside and out of his body with ease, and can shape it into what object and density he wants, but has yet to realise his true potential. An important note: Anko is easily dissolved by blood due to an extreme chemical reaction, and is eaten away by it until nothing is left. As such, it can't really be used to pierce bodies, and can only be used defensively against standard mobians. However, it would have no issue in taking apart robots and anything which does not bleed. Boa can suddenly create a hardened blue shield with a crystal-like exterior to take blows from weapons. While tough as steel, a few harsh blows can shatter it and stun Boa for a few seconds. This is his main form of 'attack', and when confronted with a touch situation, he'll cover himself in it. If he's close enough to an opponent, Boa can form the anko gas around their limbs then suddenly solidify it, pulling them back and ensnaring them out of thin air. He can only keep this up for so long, as eventually he does need to pull it back into his body. He's less practised with this manoeuvre as he's more likely to run away and avoid close aggression. The power to basically create anything means that he has plenty of options when trying to handle a problem. Seriously. He can get creative with it. Boa's body can reform and change, and thus adapt to situations if necessary. He IS classified as a shapeshifter. However, he doesn't like to change himself, and often forgets that he can. Although he doesn't speak like it, he's an incredibly logical and analytical person and can often notice things others can't. In addition, those multiple pupils allow absolutely fantastic eyesight, even at night. Therefore he can also notice very, very small details. He is absolutely awful at fighting, as he has no experience in it and doesn't even want to hurt anyone. An absolute pacifist to the core. Boa is bad at being under pressure when it involves his own personal problems. If it's generally a tough situation, he's fine. But if it's about himself? He struggles. He can think clearly about other matters, but struggles to reason and keep a level-head when his own issues rise up to try and strike at him. Here's a big one. Blood could essentially kill him, since it eats away at his own body. Even a drop on him could be incredibly dangerous as it burns through. It may explain why he wears clothes these days. Boa tends to put knowledge before his own safety. He's an avid learner - to a fault, and wants to know as much as possible. This sometimes lands him in awkward and overall bad situations. Vincent Blackspot; his housemate and friend. And unfortunately for that hedgehog, that's all Boa sees him as. While he does recognise that Virus does hold romantic feelings for him, in no way does he return them. After having saved Virus' life multiple times, more from himself than anything else, and repeatedly pulled him out of bouts of serious depression and misery, Boa often finds himself utterly exhausted by Virus. Despite that, he has a lot of respect for his housemate for conquering his past and trying to better his present, and will always be there to help him if he needs that shoulder to cry or vent on. Boa considers Elec an excellent friend, who's both morally in the right place, but is also just generally a wonderful person to be around. Despite her bubbly nature, Boa recognises Elec as a strikingly intellectual and responsible woman, and holds a great respect for her, especially considering all she's been through. Originally her teacher on how to handle her powers, he now instead takes a step back to allow Elec to have her own life with her child. Though despite her intellect, she still calls him a poet. And he's not. It's patronising. Please stop. Vas is... well, for starters, an interesting specimen! Why, honestly he's never seen someone quite like him, and perhaps because the same could be said to Boa, it's why he feels a particularly strong bond with the nocturn. He's delightfully unusual and would love to know more; not only about Vas' general species but how his body functions and how the anatomy all fits together into this huge centaurish mass. It's genuinely incredible. ...E-eer ye-ys, anyway, about Vas himself! He's powerful! Strong! Absurdly fast and knows his strengths and weaknesses! And is also a wonderful and all-around nice person to talk to, even if his wit is far too sharp for Boa at times. And ignoring the absolute mess that was the 'double date', he gets on very well with him! Vas is someone to look up to, both as an inspiration and because you kind of have to. He's huge. Zankh terrifies Boa. Genuinely, utterly terrifies him. Not only does this creature represent what he tried to run away from, but she's also chasing him relentlessly, trying to literally murder him with a weapon that haunts him. She's delusional, powerfully driven by a single goal, and hammy enough to not be taken seriously by others. And after she sliced off his left arm and almost killed him, he doesn't hate her. In fact, he doesn't even want to see her hurt. He doesn't feel any sort of contempt - only regret that his own actions lead to this. Boa doesn't know how he was made. There was a moment when he didn't exist, and then he did. He remembers the feeling of the threads of his very being, his anko, being woven together to make him. There was a moment when he could not think, and then his anko soul was created, and then he could. He remembers forming as a magnificent creature before the ankojin of the Nameless Kingdom. And he remembers their awe. And their fear. They saw him as beyond them. They all did. They wished for a god. So they, subconsciously, created one. The Nameless Kingdom itself is an enigma. Though calling it a kingdom would be a stretch. In the desert country of Eraki, there is a small town, or more refurbished ruins, housed by creatures of unknown species - named Ankojin. They don't leave, and they're overly dependant on those who lead them. And the leaders do not like outsiders. It's a restricted and enclosed society. This strange species also have an ancient hierarchy they depend on - a King or Queen of 'royal blood'. And Boa was a spanner in the works. The King was no longer necessary, for they all obeyed the creature they called the Beast of Anko. The god bathed in wealth, goods, and power. It's first thoughts were seeing itself as a higher being, and it only was furthered by the holy treatment it was given. The Beast saw itself as a god as the people did, but it was not. It was merely a construct of their life essence. But it didn't know, and the people didn't know, and so the religion of the Beast was formed. The King grew jealous. The Beast used his people as servants, playthings for its own amusement. Arkaus's power was stripped from him, and he could not lead his people to thrive. The Beast was actively destroying their society by feeding its own ego. But he knew it would be fruitless to try to bring it down. That was until a demon spirit whispered in his ear, offering a deal as sweet as a forbidden fruit. "I will grant you a weapon to slay the titan," it purred, "in return, we work together. Your kingdom will be ours." The King agreed. The demon, named Moruluhm, forged a sword out of the deal. Its blade was cursed, forever slathered in blood. And in return, the spirit possessed the King, the two becoming one. Moruluhm allowed the king a moment to control his own body, and stepped back to allow Arkaus to plunge the sword into the Beast's body. Yet when the King approached the god, he was invoked with a sense of fear. He wondered if it were even possible, or if this was even right. His hesitance made him clumsy, despise Moruluhm pushing him to continue. And this was where the Beast took advantage of this weakness. Taking the blade for itself, in a fit of anger, the Beast sliced it across his enemy's waist. Immediately, the blood took effect on the King's anko body, and began to dissolve him. Screeching and screaming in pain, the blood now having taken both of his legs entirely, Moruluhm became the dominant spirit in the host body, and plunged themselves into the shadows. The act of aggressive defiance was not something the Beast had properly encountered before. His ego was damaged, and he flew into a rage not only at the city, but at his own people. The god was a monster, and his tantrum would be a nightmare told for years to come. Few tried to reason with the Beast, for most fled, or tried to fight back. Lives were lost under the claws of the monster wielding the Godslaying sword, and the tantrum lasted until all was silent. And when its tantrum subsided, all the Beast felt was regret and sorrow. The Kingdom was destroyed, he had killed, and people were hiding for their lives. Dropping the weapon that was drenched in both red and blue, the Beast fled the Kingdom. And it would never return. When it would be rebuilt, it would be under the watchful eye of the king's daughter, Janjia. This event, and the Beast's discovery of other cultures, is what lead to its eventual change of heart. Soon, it would no longer be the Beast of Anko; it would be known as Boa. The great form of the god wandered the deserts of Eraki. It could no longer return to the Kingdom, for the people would not adore or dote over him. They were scared of him, they fled from him. So instead, he searched for another purpose. And he found a town. A small desert town. He approached, in all his majesty, and declared himself a god over the strange, furry people. Because he was one... right? Needless to say, the Beast was met with opposition. The people didn't appreciate a strange being claiming territory as their own. He was met with fire and fury, quite literally. The Beast didn't want a repeat of the last 'incident', and refused to fight back. He refused to let his anger get the best of him. But the opposition, the civilians, had strange and bizarre abilities. Fire spurting from their hands, summoning gusts of wind with a single motion, it was foreign to him, and it scared him. He fled as quickly as he'd arrived, shunned from this town that had powers beyond his understanding and capabilities. How had they done that? The civilisation was new, had things his old Kingdom never had, with people like he'd never seen before. His mind whirled with possibilities, and he decided to try a different tactic with the next one. He'd be like them. His form a shifting mass, he created a new form for himself. It was smaller, more compact, more mobian. He was no longer the Beast, for he was no longer trying to be a god. He was instead Boa, the wanderer. Boa reached another town, and he was accepted far more easily. He received weird looks, for his form was still a flawed mobian, but he was no longer taking this town as his own in his godhood. He walked, and he observed. And as mere weeks went by, he fell in love with the world. The cultures, the people, the sheer difference between what he was raised to think, and what was beyond the borders of his old Kingdom. The more he mingled, the more questions he had, and the more he wanted to answer them. He would ask the how or the why, yet there wouldn't be an answer. "It's just how things work around here," they'd say. How could they not know? He wanted to discover for himself. The title of the Beast of Anko was soon lost on him, because he was more interested in being Boa. He was liked, and it warmed his heart. It wasn't a forced kindness, but it was genuine. This changing mindset altered his appearance subconsciously, and his form took on subtle alterations. He had spines like a hedgehog, his circle marking had 'shattered' on his head, and he was small and humble. The potential research he could do was limited. The town he resided in was small, but the people spoke of a bigger city. They spoke of Trinus in the main continent and all the weird and bizarre things that went on there. Boa, like any person who was too curious for his own good, travelled there. With the money hey had acquired from the odd jobs and small disoveries, Boa took a plane over to this mysterious city. It was here where Boa spent most of his life. His research eventually reached an academic level, and his experiences and his intelligence proved that he was well-capable in various fields. He went from a strange foreigner to a well-respected scientist and researcher, and he was well and truly happy. It was here in Trinus that he obtained a job as a Drinks Tester for the Leafy Bar - an odd bar that focused on strange, alchemical drinks that transformed the body. He was drawn to this, and was only seeking knowledge as he had enough pay from his studies. It was here in Trinus that he became a lecturer for several Universities, and utilised their technology to prove his theories. It was here in Trinus that he made friends. Real, genuine friends that he cared for. He met Elec, his bubbly and excitable friend. He met Virus, his housemate. He met everyone at the Leafy Bar, who he considers family. But he couldn't run from the past forever. During one night, his own obliviousness caught up to him. Boa was struck with a searing pain, and only when he turned around did he realise genuine terror. His hand had been cut off... from a sword that was slathered in blood. In the hand of an ankojin with white fur. For a moment, a single moment, he thought it was the Demon King. But it was Zankh - his granddaughter. His arm was starting to dissolve. He was unable to feel pain - his body didn't have pain receptors. But that sword was the first pain he had ever felt in his life, and he screamed and writhed and sobbed and it was all he could focus on. He was paralysed with the feeling, and the royal Ankojin held the blade up, to kill him in this moment of weakness. She was silent, her face was mortified and conflicted. Her hand shook. It was the perfect opportunity to kill the god that had ruined them. The pain didn't stop, and Boa's screaming eventually attracted attention. He was brought to a hospital where they extracted the blood out of his body. But they couldn't save his arm. It had left a mark, and he couldn't simply reform it back despite his shapeshifting properties. It was gone. He lay unconscious for weeks, turning into several months, where he rested in a coma-like state. His form, as he slept, altered once more. He couldn't run from his past. He couldn't leave it behind. This internal realisation changed him again. His old circle marking appeared on his head, and the hedgehog quils vanished with more hair-like droops. It was subtle, but it was a reminder that he was still a god to those people. And upon waking, he couldn't change it back. He couldn't change himself. It was a permanent fixture, because subconsciously, he refused to. He deserved this. Eventually, he left the confines of the Hospital. His life became a blur. Friends panicked, his research slowed to a crawl, and he was paranoid. He didn't want to be alone. He didn't want to see her again. He didn't know where Zankh was, or where she'd strike next. And he still kept up the facade that everything was fine, and lied to his friends of the cause for his missing arm. They couldn't know. He couldn't tell them about the person he was, or what he'd caused, and how the attack was justified. Virus, his housemate, used his abilities to give him a new arm. A psychic construct that would act as he willed it. But it was still a reminder of what had transpired all the same. Gradually, Boa got back into the swing of things. He joined a guild. He kept making friends. 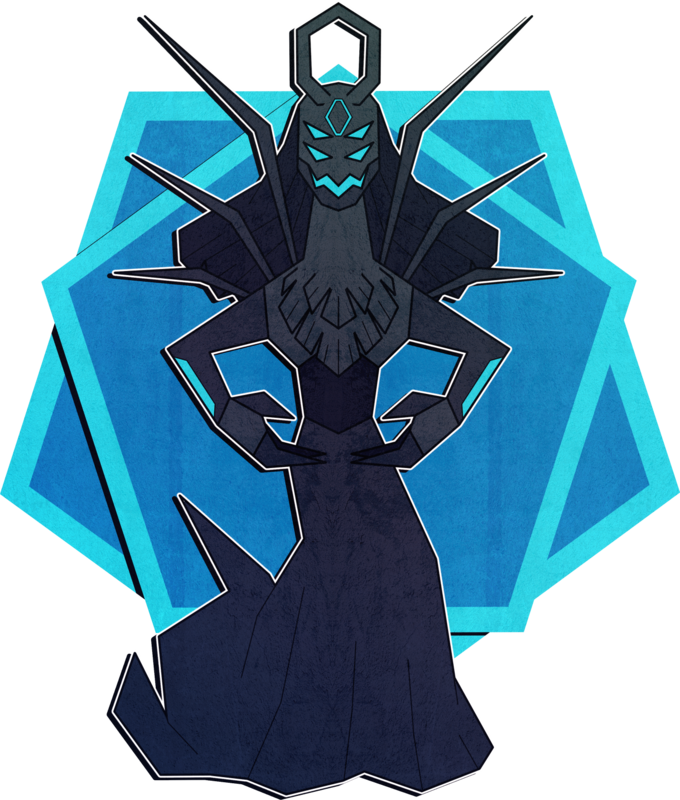 He published books and became a well-respected theorist of the arcane. His name was recognised beyond his weird appearance. But there's still the constant fear, the constant paranoia that Zankh will strike again. And when she does, he fears that she will not be as merciful. On the plus side, he wears swanky clothes now. Boa is a character within the sprite comic Bar'd which is run by the wonderful and fabulous Dregan. If it weren't for this comic, he probably would have been scrapped as a character a long time ago, as well as the species and idea in general. He's went through only two design changes, despite having existed for about 7+ years. This is not including the addition of clothes, which is very recent. he is me son and hearing things like that is so incredibly nice!! This is a neat character here and from the personanilty section and appearance he seems like a author you would find just out on the streets which is great! » SCCT Book Super League I is already over !